Here is an album of original and traditional roots music with captivating female harmonies. A full acoustic line up with upright bass, fiddle, guitar, banjo and mandolin gives the album a bluegrassy feel, with a sprinkle of harmonica and accordian for traditional undertones. 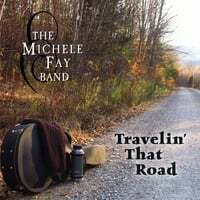 Some of Michele's original songs are particular to the history and cultural landscape of Vermont, (Rutland Town, Addie Card, These Working Hands) while others are catchy songs you can't help but tap your foot and swing with (Hold On to Your Golden Crown, Simple Life, Tell Me What Good). Her other originals, (Old Love,Travelin' That Road) are more reflective and subtle, and balance well with the traditional waltz of Midnight on the Water, the driving beat of Graveside song, and the ethereal accapella song Across the Blue Mountains. This album is so well rounded and grounded it will be hard for you to pass it by.